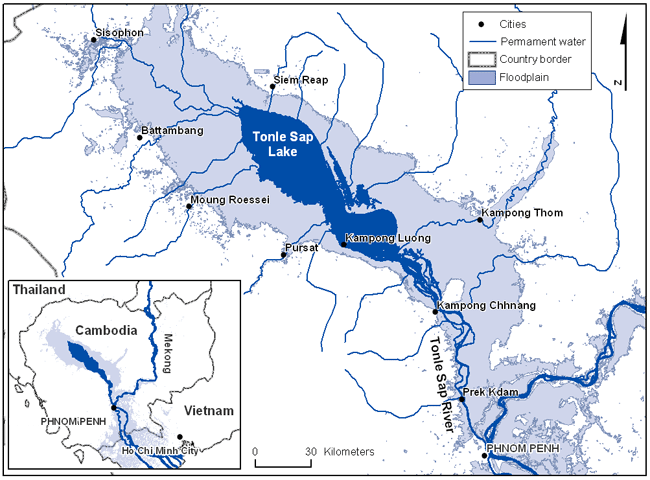 Tonle’ Sap lake | Where in the world are the Uricks??? We set off in the morning on a 50 km drive to We set off after breakfast on the 50 km drive to Kompong Khleang, a village on Lake Tonle’ Sap. The lake is the largest in SE Asia with a surface of ca. 1,000 sq. miles but that swells to over 6,000 during the monsoon season when the plains are flooded. The large majority of people in this area are joint fishermen and farmers and all the houses are either rafts or built on very tall stilts. There are bridges and roads in the villages, but both are submerged during the flood season. We walked around the village and observed women drying tiny little fish, people repairing fishing nets, children playing, and people going about their daily lives. It was not the prettiest of villages with lots of dust from the roadway and quite littered, but interesting none the less. On a small section of the main road to Phnom Penh one finds numerous stands selling “bamboo cakes” or sticky rice cakes in bamboo. We stopped to try one – sticky rice is mixed with coconut milk, black soya beans, a little sugar and salt. It is stuffed into bamboo and a bamboo leaf filter is inserted. It is then roasted for several hours. When cooked, you peel back the bamboo and eat! Quite delicious! This entry was posted in Cambodia, Eating Out, FOOD, TRAVELLING. Bookmark the permalink.